Our old-fashioned fishing lawn gnome is busy stringing his tree branch so he can catch himself some dinner! This outdoorsy gnome comes highly detailed with his hunting vest and rustic tunic, trousers and boots. There's nothing cooler than a garden gnome fishing. He even has a small basket to carry his supplies in. His cheerful demeanor will put anyone in a good mood, whether they catch the big one or not. This garden fishing gnome is 15 inches tall, made from high-quality cast stone resin and makes a perfect gift for fishing aficionados. We offer not only garden gnomes fishing, but also garden gnomes climbing ladders, playing checkers and snorkeling. 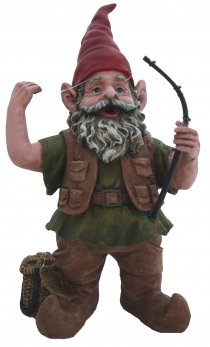 Pick up your garden fishing gnomes and other crazy characters at great prices from GardenFun! We have so many different kinds of gnomes; you'll want to do some "gnome fishing" on our website so you can see them all.